Hale Nana Kohola, Whale Watch House, is a 4500 sq.ft. architectural masterpiece on the beach in beautiful Puako. Kayaking and snorkeling only steps away in pristine clear coral reefs where Humpback whales come to breed from January to April and the sea turtles reside year round. This home offers 2 master suites, 2 guest bedrooms with their own baths, a media room with a bath, an open living, dining and gourmet kitchen area with cathedral ceilings that opens to a huge covered lanai adjacent to the 46' 360 degree infinity pool. Both master suites are complete with two lavatories, tub, shower, separate toilet rooms with bidets and large walk-in closets. Great care was taken with the landscape, creating a beautiful palm tree oasis including a hammock stretched between two palms on the ocean side. This home is one of the few in Puako with a sandy beach right in front. 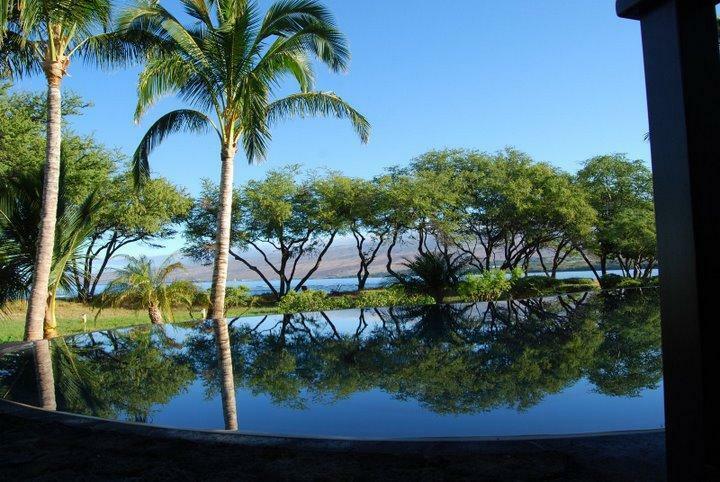 This gorgeously designed home is topped off with a 3rd story whale watch retreat that offers 360 degree views across the land and ocean from the sunrise over Mauna Kea to the sunset over the Pacific Ocean. $2,800 - $3,600 per night. 30% down to hold a reservation. Balance due 60 days before check-in. $5,000.00 security deposit. $700.00 cleaning fee. 4% processing fee. Listed rates do not include tax. Holiday and peak season rates and required length of stay may be different than quoted above. Credit cards, cash, checks and wire transfers accepted. Minimum night stay varies amongst the various rental units. Many rentals have 30-night minimums. Tax number: TA-003-387-3920-01. Our special Puako vacation Quite possibly the best vacation I've ever had. We are frequent visitors of the Hawaiian islands but never had accommodations quite like this. The pictures on the website did not embellish the home but accurately depicted the vacation rental. We were there for an anniversary celebration and we had our children and grandchildren there and it easily fit our needs. We all agreed that Puako had that "old Hawaii feel" which was unique to the other islands. The owner provided us with paddle boards, kayaks and other ocean related equipment which was greatly appreciated. Would definitely recommend to friends or relatives. This was my 2nd stay at this home, and we are already booked for our 3rd. It is perfection! The location, the infinity pool, the outdoor hot shower, the 4 gorgeous bedrooms with en-suite bathrooms, the fabulous music selection and speakers throughout the house, the "they've thought of everything" kitchen, and the insanely fabulous adjustable lighting - oh, and the views - spectacular! All of that and then the hard to explain pure MAGIC of the house itself. The design is 1000 on a scale of 1-10. I don't know the owners personally, but I am in awe of them for designing the perfect home...stunning to look at and practical in every way. Even the few hours that I had to work were made bearable by having easy to access internet, and views over the living room and out to the pool and the ocean. Speaking of ocean...we were in it every day, because the house comes with 3 awesome kayaks, and 4 paddle boards, and a phenomenal selection of snorkel equipment. Turtles aren't just in brochures either, they are everywhere, and beyond the tide pools is some of the best snorkeling in the world. When we weren't in the water, or in the stunning living room, or taking an afternoon nap in the fabulously air conditioned bedrooms (yes, it IS nice to have air conditioning available if you want it), we were busy feeling like locals - using the great bikes to pop down to the Puako market, where you feel welcome after your first visit. ISLAND GOURMET grocery store is very convenient too, just down at the QUEEN's SHOPS-hard to explain, but Hale Nana Kohala is easy access to everything, yet feels remote and private while you are in it. This review would not be complete without mentioning the pre-arrival. Jodi is AMAZING! She feels like a best friend before you arrive, and will do as little or as much as you like to advance your stay. She will stock the house with the hardest to find of items, or will open up the house, and let you feel like you are arriving at "your" own place. She is anticipatory, informational, and always only a call or just an email away. She masterfully schedules regular maintenance, lawn & housekeeping around your schedule, so that your privacy is never intruded upon. In closing,I hesitated to write this review, because I didn't want too many people to find this gem, but that wouldn't be fair. The world would be a better place if more people got to experience this kind of a "hopefully not once in a lifetime" kind of magic! THANK YOU!! Mahalo for the great review. Our manager and my wife and I look very forward to you coming back next year. We will keep the tiki torch on, aloha until the next October. From the moment we arrived, until the moment we left, this house was the perfect location for our family vacation. The manager is friendly, helpful, well-informed. She welcomed us to the property and gave us a summary of how things work. The house is as beautiful as it photographs. It has multiple living areas, so family members can drift off and have quieter moments when needed. The house is perfectly situated, with a soft grass lawn, and sandy beach leading to tidal pools. Bring surf shoes to walk on the lava at the tide pools. There are crabs, fish, shellfish, sea urchins, turtles to marvel at in the tide pools. There are plenty of birds surrounding the house throughout the day. The house faces relatively north, so as you sit and enjoy the wonderful view across the pool and the lawn to the ocean, you aren't necessarily fully in the sun, but there is plenty of deck space in the sun too. The pool is heated, which is a great treat on the islands. It has a large flat area that is several inches deep, with steps leading down from this platform, so it's perfect for small children to play in as well. We had three nineteen-month old cousins there and they were able to enjoy the pool fully. The house is well furnished and well stocked, you are truly staying in someone's home, not just a rental that someone has created. There are great recommendations in the house book regarding pretty much anything you could want to know about the house and the region. There is plenty to do in the area, and around the island, but in a house this beautiful, we didn't feel a great urge to venture of for adventures. We had plenty right here, staying put. I highly recommend this house; you cannot be disappointed. I hope to return again next year.